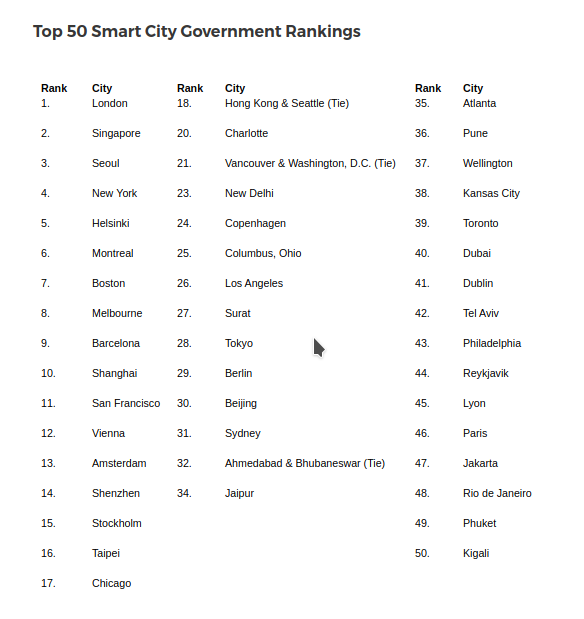 SINGAPORE, July 9, 2018 /PRNewswire/ — Eden Strategy Institute today unveiled the rankings of the Top 50 Smart City Governments globally, from a study conducted in partnership with OXD (ONG&ONG Experience Design), that analyses the diverse approaches towards developing smart cities around the world. “Smart Cities are taking centerstage in securing an adaptable, inclusive, productive, sustainable, and resilient future for humanity. Leading the development and re-invigoration of high-performing and loveable cities is one of the grandest challenges of our time,” says Mr. Calvin Chu Yee Ming, Partner at Eden Strategy Institute. “Governments are eager to explore different ways to integrate digital technology, knowledge, and assets. This study offers unprecedented access to the most effective instruments to help governments become more responsive to users, improve city services, and make cities more loveable,” he explained. “Through this study, we hope to provide insight into how city governments can coordinate their smart city initiatives better in ways that reflect a deep understanding of the human condition and the transformative power of citizen ownership and empowerment,” says Mr. Joshua Teo, Associate and Lead at OXD.